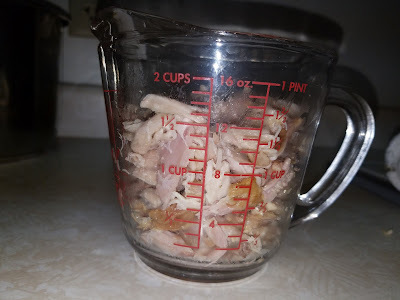 Meal number six from the two rotisserie chickens..
Before I started making this meal, I had 2 bags of the chicken bones/skins left (bags #2&3) and needed to prep them to make 3 separate meals. 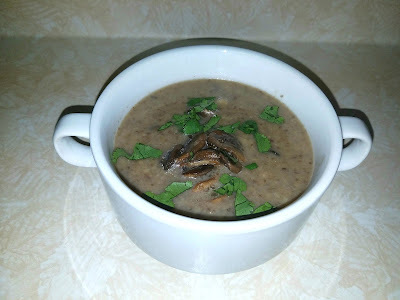 The creamy mushroom soup, broccoli cheese soup, and chicken and rice soup. Make the broth. 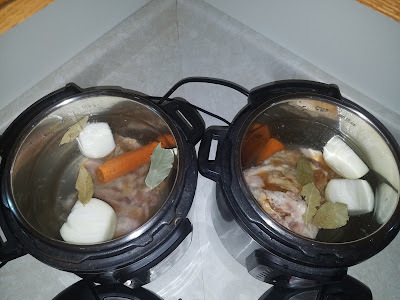 Cook bones, onion, carrot, and bay leaves in the instant pot for 30 minutes on the soup setting. 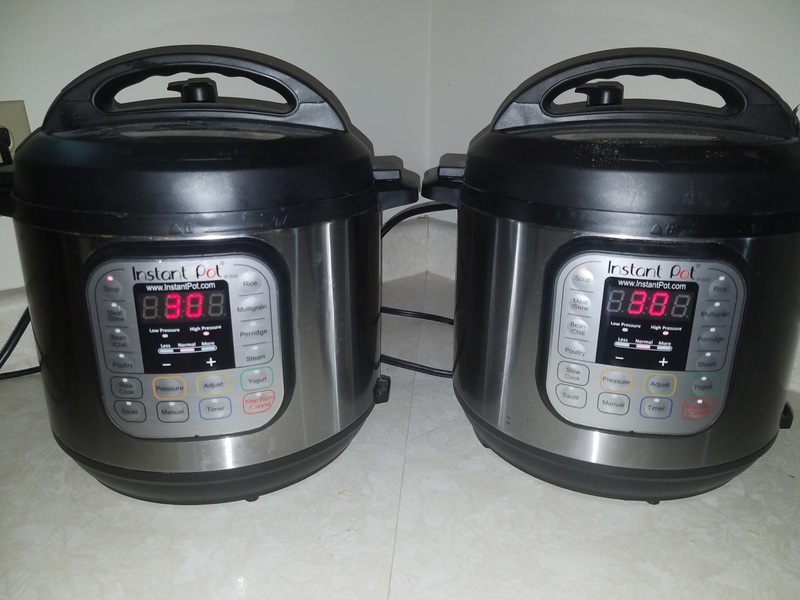 I have 2 instant pots so I was able to do this at the same time. One bag of bones, one onion, one carrot, and a few bay leaves per pot. Add enough water to reach the 10 cup mark. Cool and strain both pots into one big pot and separate the meat from the bones. Discard the bones, onions, carrots and bay leaves. Or compost it if you compost. 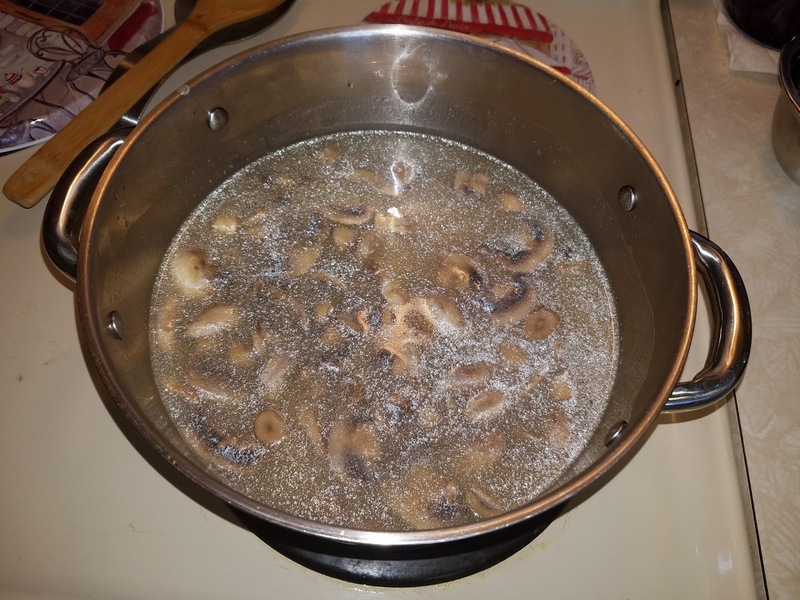 Not a whole lot of meat, but enough for a soup..
Reserve 5 cups of broth for this recipe. 6 cups for the broccoli cheese soup, freeze it unless you will be making it in the next few days. 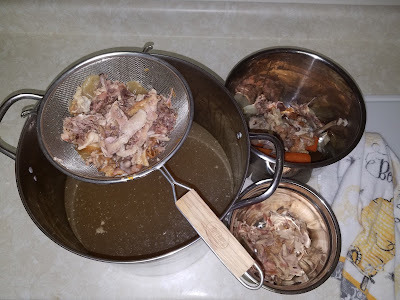 And the remaining 9 cups of broth (plus chicken meat) for the rice soup, also freeze unless you will be making it in the next few days. Now for the Creamy Chicken Mushroom Soup. It helps to have a Dutch oven for this, but I don't, so I transfer from the frying pan to a regular pot before I add the bulk of the broth. Heat 2 tablespoons of butter in a Dutch oven (or frying pan) over medium-high heat. 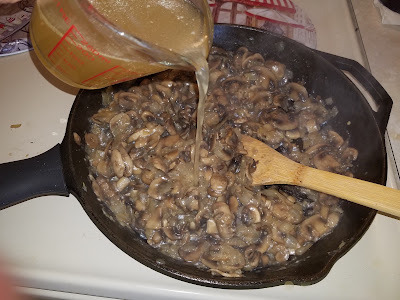 When melted, add 1/3 of the mushrooms. Cook until dark golden brown, stirring occasionally, about 5 minutes. Stir in salt and pepper to taste. Remove mushrooms from the Dutch oven (or frying pan) and set aside. 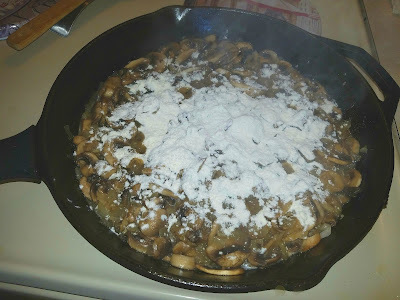 In the same Dutch oven (or frying pan), melt the remaining 2 tablespoons of butter. 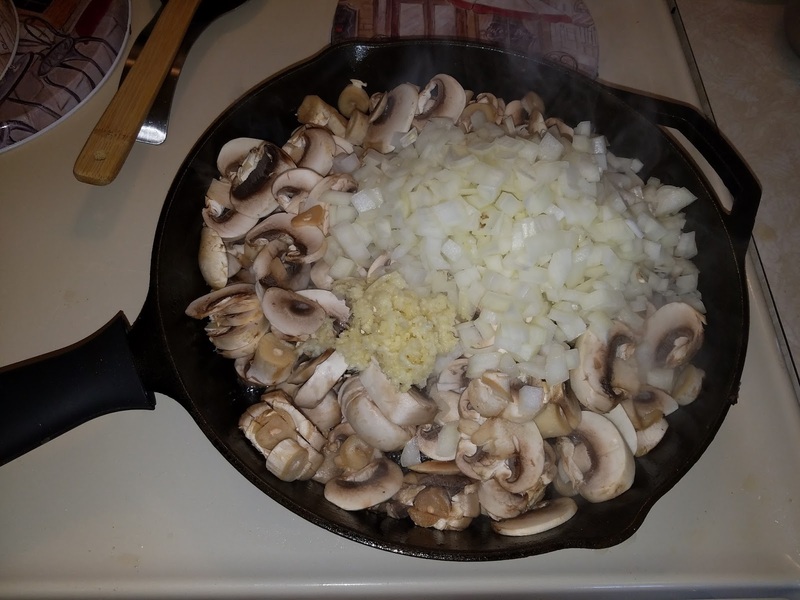 Reduce heat to medium and add the rest of the mushrooms, along with the onion and garlic. 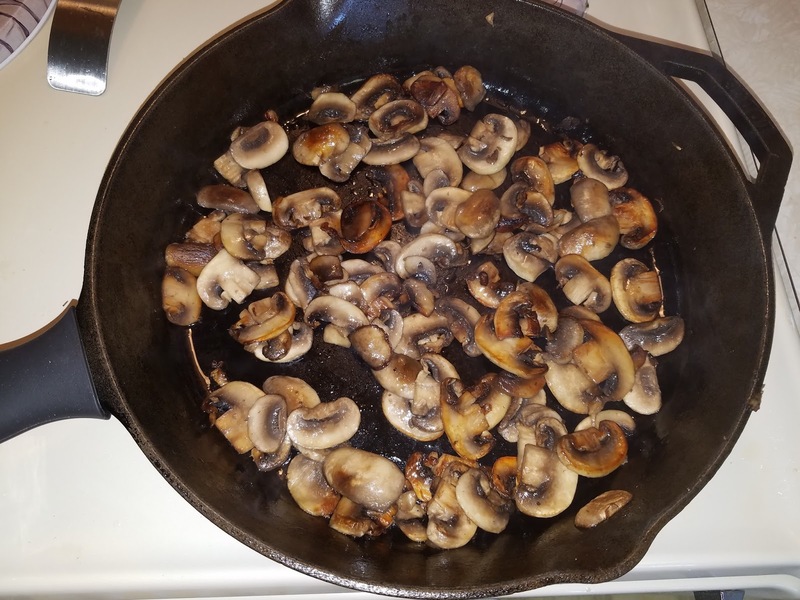 Cook, stirring frequently, until mushrooms are soft, about 5 to 6 minutes. Sprinkle the mushrooms with the flour and stir to combine. Add salt and pepper to taste and stir constantly for 3 minutes, allowing the flour to cook. 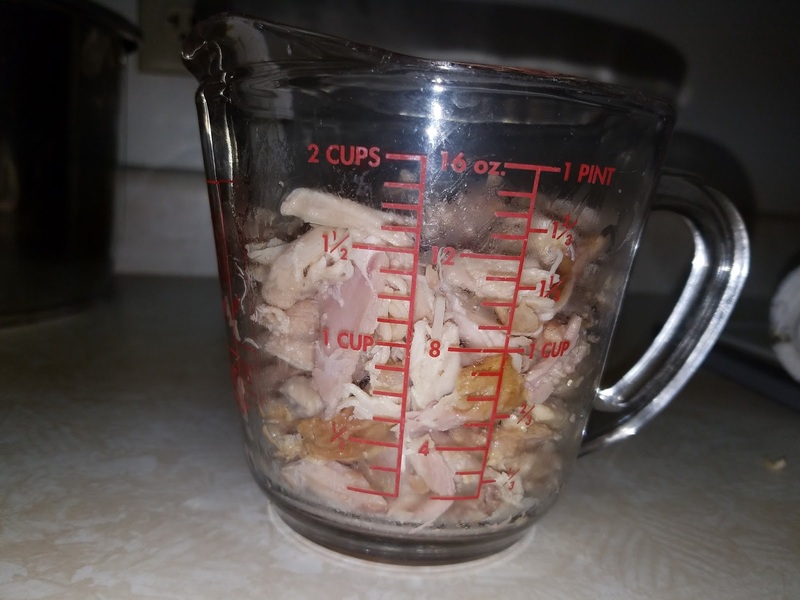 Slowly add 1 cup of chicken broth, stirring while you add. Allow it to heat and bubble up for a couple of minutes. 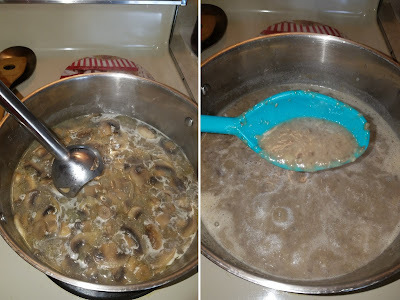 Slowly pour in the rest of the broth (this is where I transfer from the frying pan to a regular pot, but no need to transfer if you're using a Dutch oven.. I really should get one). Keep stirring to reduce the likelihood of lumps. Lower the heat and simmer for 20 minutes, stirring occasionally. 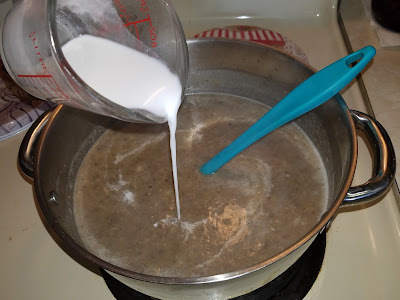 Using an immersion blender in the pot, puree until mushrooms are mostly broken up into small bits. Add the cream and simmer for 10 minutes. Salt and pepper to taste. 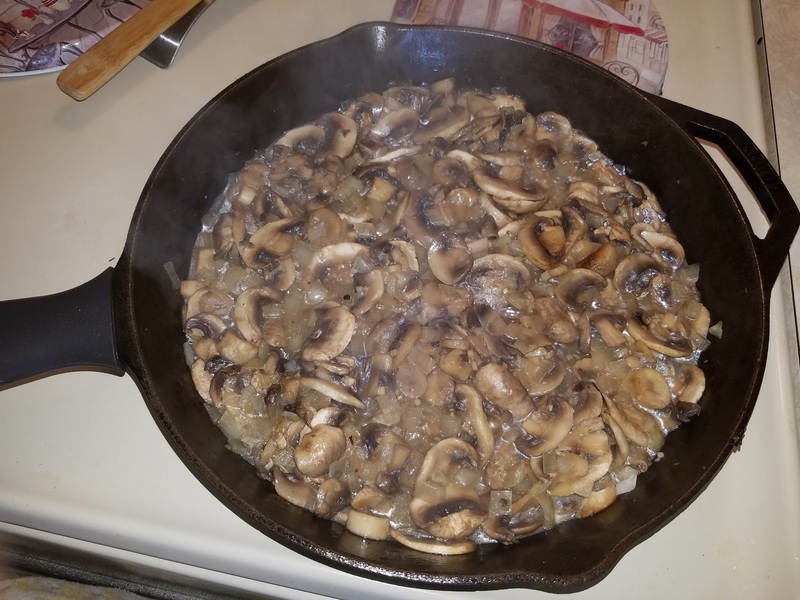 Serve warm with reserved mushrooms on top. Toothbrushes, toothpaste, and messes, oh my!